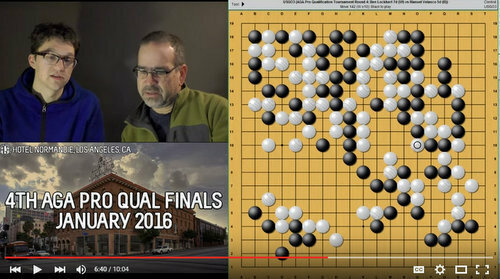 In our latest batch of brief video game highlights focusing on key points in selected games, Norman Tsai 6-dan shows how Jeremy Chiu’s attachment to unimportant stones in his third-round game against Andrew Lu causes him to choose the wrong direction of play. In Daniel Gourdeau’s third-round game against Aaron Ye, Tsai explores what happens when a forcing move turns out not to be forcing after all. The dangers of gambling on a big kill are the focus of Tsai’s review of Ben Lockhart’s third-round game against Sarah Yu. And the problem of defending unimportant stones comes up again in Eric Lui’s third-round game against Manuel Velasco. Finally, second-seeded Ben Lockhart reviews his fourth-round game against Manuel Velasco. You can check out all of our videos on our Pro Tournament playlist.